I tried to stay asleep until the morning but it was difficult. I went to bed around 10:00 and my eyes kept opening throughout the night. Finally Mimi took a shower around 6:00 in the morning and that had us both get up. We prepared our luggage and got ready to go the the Fulbright orientation at 10:00. The orientation was held in the Sannyo Grand Building about 3 subway stops from the hotel. I met with Jinko Brinkman first and she went over the structure of the Fulbright program and general guidelines. She even gave me a pretty pin. Then came the man that everyone was waiting for, the money man. He proceeded to explain the different parts of the allotment and the schedule of payment. The first installment was quite large. I received some money in cash and the rest came in the form of a check. Checks are rare in Japan and this one could only be cashed at the local branch in Tokyo. Then I met with other program directors who explained communication protical to me as well as listening to my plans with great interest. Everyone was extremely nice and willing to help me along the way with my project. After talking to them I really felt that I had received a Fulbright. Another grant recipient came for orientation as well and happened to be from St. Louis of all places. After orientation I went to the bank and cashed the largest check that I have ever held in my life. The stack of money was over an inch thick and now sits on the floor in from of me between my feet. Don’t get robbed now. Currently I am taking the Shinkansen to Kyoto where I will transfer to the local train to complete my journey to Mimi’s parent’s house in Nara. 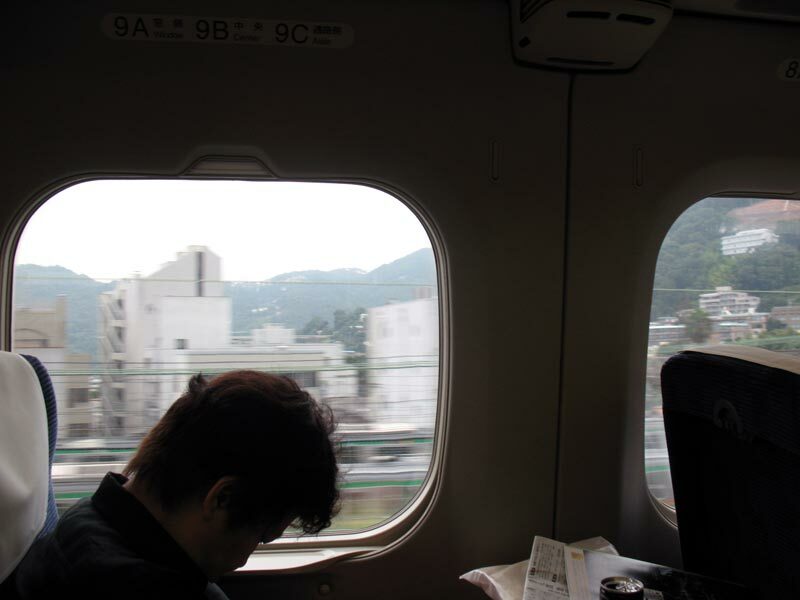 The Shinkansen or “bullet train” is fast as well as comfortable. Vendors walk by with a smile selling coffee and bentos, Japanese box lunches. Since Japan has no open container laws, myself and quite a few other passengers are enjoying their favorite adult beverage. In my case it is a normal Kirin Lager. After a few days rest in Nara I will go find an apartment in Nagoya and hit the ground running on my project. I want to complete as much as possible in this limited time frame and don’t want to waste any time. Now I will sit back and enjoy my lightning fast train ride to Nara, passing right by Nagoya ironicly.